> Ok, so I am caught up in the rush to read the last installment of Rowling’s popular series. I just wish I didn’t have to steal my way through the book! My oldest purchased it at 12:01 the night it came out, and everyone in the Baker house has been grabbing at it the moment someone else eats, or takes a bathroom break. I am not into writing spoilers, but those who care may not want to read further … (but trust me, there is nothing here to ruin the story). 1. Is Snape somehow faking his turn to the dark Lord, or is he really as evil as all that? Did he really kill Dumbledore? Or maybe the better question is: did he really TRY to kill Dumbledore? (I still think the old man is around in some mysterious way). The jury may still be out on Snape, but I would have to hand it to Rowling if she could extract him from all the explaining he would have to do to prove otherwise. 2. Is Dumbledore really dead? Did he really do all the horrible things that the spin doctors are now saying about him postmortem? 3. 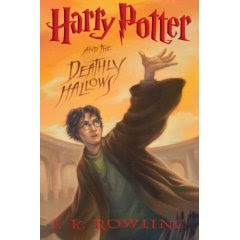 Will Harry Potter make the greatest sacrifice before the last page of this book? 4. Will there be some shocking traitor surprises before the end? Even as I start on the back nine, Rowling keeps her readers guessing – though I have some pretty good guesses brewing in my own problem-solving cauldron.